The wifi power bank camera uses the 1000ma battery which can withstand up to 6.5 hours. The videos will be recorded in the high resolution of 1920x1080 and can extend support up to 36 cameras. The camera has the good battery back capacity which allows it to work for long hours and even it works when charging. The remote controlling accessibility of the camera provides you the opportunity to view the live video or the recorded video which enables you to keep an eye on what's happening in office/home. The wifi capability of the device ensures you to control virtually and able to view the live and recorded videos at any time and anywhere. It supports P2P networks and ensures you can use your high-speed internet or wireless internet router for accessing virtually. The high-quality wifi spy camera gives you the HD 1080p resolution for crystal clear image capture and you can adjust it as per your needs. 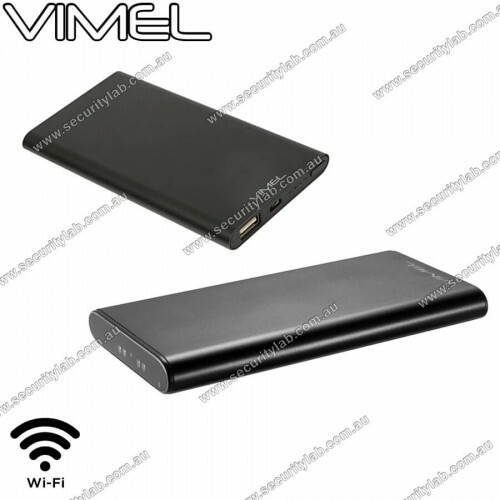 If you are looking for the ideal security solution for your home and office you can buy this Vimel’s power bank spy camera. As like other products Vimel’s this wireless spy camera too is a quality product with user-friendly manuals. It looks like a normal battery pack which you use to charge your electronic devices like mobile phones, tablets etc. this long battery life spy camera contains 2-megapixel built-in camera with the angle providing 78 degrees. Fashionable appearance, with stereoscopic UV finish on device body. Professional True Full HD 1920x1080P is ultimate solution for security as it can be embedd..